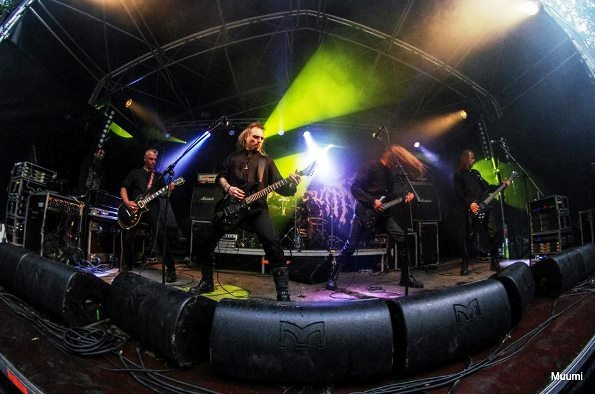 Next interview I started to investigate the Estonian extreme pagan scene and first band I gefunded was legendary Tharaphita, the originators of Estonian extreme metal scene! 1.Hails! First of all, present yourself and your band for the readers and describe the band’s history! The band was formed in 1995 in Rakvere (Virumaa, Estonia). In 1993, I already had a clear vision regarding the kind of music I wanted to create. At the beginning, the band was supposed to carry the name Ancestral Damnation, and the music was to be raw black metal. For different reasons the idea changed somewhat and the black metal core of the music was complemented by pagan thinking, some epic elements and influences of heavy metal and thrash metal. The first rehearsals with the initial line-up of Tharaphita took place in March 1995. Until now we have released five full-length albums and given about a hundred gigs. 2. Explain the meaning of your band’s name Tharaphita. Is it a name of a thunder god in Estonia? It was believed by the ancient Estonians that their fire-god Tharaphita flew from Ebavere in Virumaa to the island of Saaremaa. I am from Virumaa and I have always had a strong interest in the Estonian national heritage. Tharaphita was the only ancient god mentioned in written sources handling the Estonian history. It is known that a meteorite had crashed in Saaremaa and formed the crater of Kaali. The iron ore contained in this meteorite enabled the ancient smiths to forge strong weapons and bring glory to the Northern warriors. This lake of Kaali is also depicted on the cover of the new album. 3. Tell about the pantheon of Estonian gods and about the cosmogony. The Estonians worshiped both the souls of their ancestors as well as the fairies. According to Sutrop (2002), there exist references to only one great fire-god and this is Tharaphita. The traditions and rituals somewhat differ in each area of Estonia, but many features are common with the Scandinavian heritage. Estonian culture and mythology developed in the conditions of the end of the Ice Age around 10 000 BC. Survival was not easy back then. Estonian sailors, warriors and traders are well known in the Scandinavian tales, but there is also much in common with the heritage of the people from the east. Therefore, it can be said that the nature and its amazing expressions had spiritual meaning for our ancestors, as they did for other cultures in that era. 4. When I recall the Estonian myths and folk tales, to my mind comes only Suur Tõll. I hope you can enlighten me on this subject, to name a few of the most important mythological works and documents, as well as key authors that have nurtured Estonian national heritage. Probably all Estonians have listened to stories about Suur Tõll in their childhood. There are several references to Suur Tõll in Estonian national heritage. These stories tell that Suur Tõll was an extremely strong giant, good-natured but hot-headed. He always tried to help others in situations where he felt it was the right thing to do. Many stories talk about his fights with the Devil. There are also legends about other giants protecting the legendary Austrvegr (the “Eastern Way”). According to a legend, he lived in a manor called Tõlluste (this place still exists in Saaremaa). In the final battle, his head was cut off, but he still promised to rise from the dead and help his people when an enemy threatens the land. In the 19th century, a parson called Peeter Süda collected several stories about Suur Tõll and published them in 1883. 5. Name the books and authors in fictional and historical literature that you consider to be of worth. One of my favourites is “Hõbevalge” from Lennart Meri. This former president of Estonia, now deceased, was also a writer and a filmmaker who studied ancient Estonian folk poetry from the birth of the lake Kaali to possible connections between the Estonians and the Roman empire. Rein Sepp is the man who translated the famous Scandinavian epos “Edda” into Estonian. Among others, the following historians have put much effort into studying and describing pre-mediaeval Estonian history: Rein Sepp, Tõnno Jonuks, Andres Tvauri. There are much more books, research and authors, of course. 6. Tell about the sources of your inspiration in music from the very beginning until now. At the beginning, we were more affected by other bands, especially those of the Scandinavian pagan and black metal scene. Later we became more focused on our own ideas, but were still inspired by several great metal musicians. Our style was neither pure black nor pure folk, or anything else; it simply became the music of Tharaphita. The music of Tharaphita has also been somewhat raw and not extremely professional, but for the Estonian metal scene at that time it seems to have been just what the doctor ordered. For me, it is most important to convert my own ideas into music, even if taking advantage of the music created by others would make me more popular. 7. Tell us about your understanding of pagan religions and about transferring it into your creativity. I have had a special connection with wild nature since I was a child. This planet is not inhabited by humans only, and all other species are not here for us to destroy. At home, I always used to explore the parts of the ecosystem making up the environment in which I lived. I have just recently started running my own little farmstead, which also inspires me and enables me to take time for my creation whenever I feel good ideas coming. 8. Does Estonia have any sacred places for the paganists that possess a special energy, and have you visited any of them? Do you love to walk away from civilization, and can you tell us any unusual stories about visiting these places? More than 500 sacred natural places have been recorded in Estonia. There are more that are not known for the public. I also have my own places, where I can privately go and feel the power of nature. One of the public events I would recommend is the festival called Mytofest, offering insights into history and providing imaginary trips through time. It takes place each summer at Kassinurme. 9. I think, that Tharaphita is the one of the bands that stands behind the origins of extreme metal scene in Estonia. Tell us about its beginnings and development. What bands do you consider worth listening to in the various genres and branches of the scene? In the middle of the 1990s, there were almost no metal bands in Estonia that could be taken seriously. Before us, there were bands like Aggressor, Forgotten Sunrise, Rattler, Mortified, Skydancer, etc. All of them had changed their musical style or disbanded by then. We launched a new wave in the local metal scene. 10. Tell about other projects, where you and your bandmates take part in. Finally, I have devoted all of my energy to Tharaphita. As a hobby musician, I just cannot put enough effort into other bands. Nevertheless, I have several ideas waiting to be realized someday, just not now. 11. How did you come up with the idea of using a synth-guitar instead of a usual synth? The idea was suggested by Draconic, who had recently bought the instrument. It sounded well, offering additional atmospheric effects. 12. You’ve got a long enough discography, but between your previous album and the new one, seven years have passed. What caused the long pause, and can we expect any new releases from Tharaphita soon? The band has been rather more a hobby than a job for us. Our rehearsals take place in Tallinn, but I live 100 kilometres away. I had several important occasions in my personal life and I wanted to spend more time home. Those arrangements have now given me much more time for making music again, and the next album from Tharaphita will definitely come out sooner than in seven years. 13. If it’s not difficult, tell about the theme and lyrics of each album, and the development of your lyrics and ideology from the very beginning until today. The music on the new album, as well as the previous ones, is a mix of black, heavy and thrash metal. Estonian history, our ancestors’ hard struggle for survival, and their fight for the freedom of their homeland have mostly inspired the lyrics. 14. This summer you played at the Carpathian Alliance fest. Describe your impressions. It is a great place in the mountains, one of the most unique festival places in the world. It was a real pleasure to play there and the audience was great, too. 15. I need to point out that I’m Russian and I don’t support the aggressive policy of Putin against Ukraine and Baltic countries. I want to know your opinion about war in the Southeast of Ukraine and your thoughts about a possible WWIII. I am extremely worried that the WWIII is possible. I still hope that governments will realize that it would not be in the interest of anyone. Although it might bring brief glory, starting the war may lead to the collapse of several countries, including Russia itself. 16. Is there in Estonian folklore any pictures of a possible apocalypse? There is no widely known apocalyptic eschatology in Estonian folklore. The tales of disaster are mainly based on historical events around the Kaali meteorite — the temporary chaos it caused and the later glory of the warriors, whose weapons were forged from the meteorite iron. The Kaali crater became sacred for centuries. In my opinion, however, an apocalypse is very likely. But I would not like to speculate about how or when it will happen. 17.Tell about your future plans for Tharaphita. At the moment, we will try to promote “Ülestõus” as much as we can, but I am already thinking about the next album. We will definitely continue as long as we have new ideas. 18.Your final words for House Of The Whipcord Zine!